Had a good day in the Studio this afternoon- put in almost 4 hours and brought the block near to the end of the cutting process. Today's focus was the figures (human and avian), cutting out all skin, hair, and items (food) held in hands. I did not cut clothing, except for the all white worn by the employees of the pizzeria. I did this because I planned to take a rubbing of the whole block afterwards and I wanted to consider the balance of light and dark throughout the composition. Most of the clothing will be cut out later, and I'll be considering the values of the various colors in choosing how to color the print. 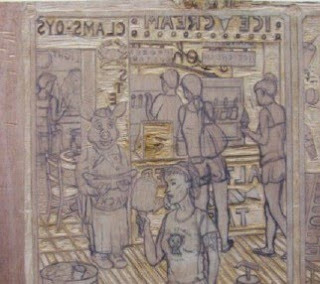 Below is the rubbing I took of the block at the end of the day. 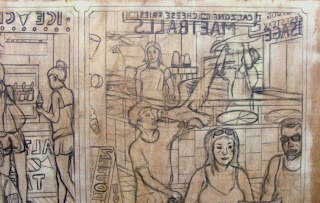 Not exactly how the print would look- the rubbing process picks up a lot of extra stuff and the lines tend to look thicker- but it gives a good idea of what to expect in the black and white proof. Today I picked up where I left off yesterday, cutting stuff at the ice cream stand. I finished the frozen custard machines first. Cutting the small details was not going as smoothly as I wanted, so I gave my smallest gouge another sharpening. Big difference. It was cutting very clean, so I was able to work quickly in cutting out the rest of the signs in that area. I was able to then move over to the pizzeria and cut all the signs in that locations- the menu boards and the neon. 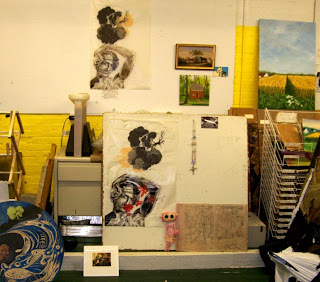 All that's left in those two areas is the figures and a few small items (ice cream cone, pizzas, etc) If I can find the time to get into the Studio a few times over the next week I may be able to finish all the cutting in time for the November critique night. When I first arrived at the Studio this afternoon I called Molly with some assorted business related stuff. Later in our conversation I gave her an update on the block cutting and mentioned my spelling problem from yesterday. She agreed that my best solution would be to remove the word from this block and add it back from another. So shortly after I hung up with her I got a gouge and erased the evidence of my mistake, as can be seen above. Most of the session was spent more productively. 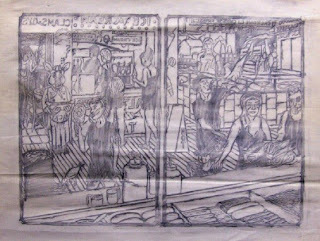 I made a few last adjustments to the drawing inside the bar in the upper left corner. 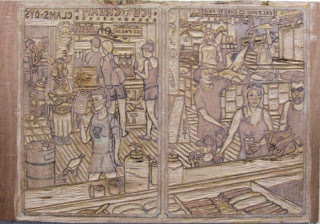 Then I finished cutting what remained- the bar top, the figures on either side of it, the bar stools, the bottles behind the bar, and some neon beer signs above them. 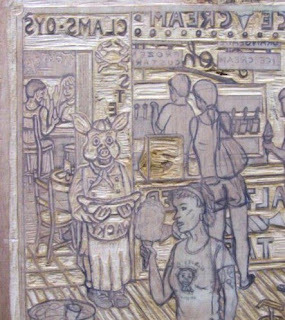 Then I moved outside the bar, cutting out the crab on the outer wall, and then cutting the pig statue. That corner is now complete. I cut a little bit more of the ice cream machines in the shop next door, then called it a day. Results of today's work is below. I'll continue with the ice cream stand next time. Back to the Studio for a few hours this afternoon. With all the spaces around objects mostly cut, I decided to deal with some interior details today. 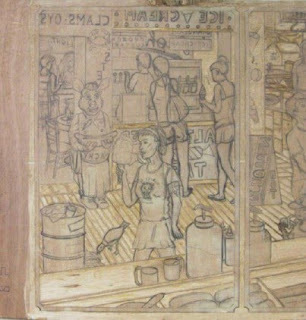 The biggest area worked was the foreground counter. I took care of the near side stuff first- the sausages, sauteed peppers and onions, rolls, and a pot of tomato sauce. Then came the far side condiments- the big pump jugs of ketchup and mustard, two squeeze bottles, and salt shakers. This whole section is now completed. Then I decided to go up the middle and cut two signs. Up top is the far edge of the ice cream stand, some menu items pictured. Below that is a portable signboard advertising something from the pizza place- zeppole. For those not familiar, zeppole are an Italian branch of the vast international family of fried dough with sugar treats, which includes traditional donuts, funnel cakes, etc. There are large zeppole with cream filling, such as the traditional St Joseph's Day treat, but at local street fairs and carnivals the more common type is a small dough ball fried until a little crunchy outside and sprinked with powdered sugar. Buy them by the greasy paper bag. I drew the letters on the sign about a month ago using an unusual type design (trying to bring a little variety to the many signs in the print) and hadn't thought about it since then. Cut it this afternoon and took a quick rubbing to see if was legible. Not particularly so, but an even bigger problem- another misspelling, worse than my meatball problem. Somehow I had lettered the word "ZEPPOELE", and now cut it into the block. Don't know how that second "E" got in there or how I didn't notice it over the past month. (I found the meatball misspelling later the same day I drew it.) Probably the weird squished together letters. This can't stay as is. One option is to cut that E into an L, which would give me ZEPPOLLE- still a misspelling but one that pops up once in a while, and a lot of people who see the finished print wouldn't know the difference. But I'd know, and with some of the letters hard to distinguish, more likely is that I'll just cut the whole word off the block and figure a way to print something else in the spot later. For the second time our BAC figure group met in the Spring Lake studio of one of the members. We are hoping our regular spot is back open for business by next month, but meanwhile we're having fun where we are. 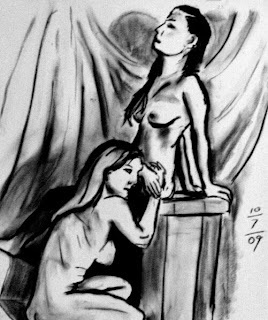 The 40 minute charcoal drawing above was my best of the night. I'm never short of things to do in a given day, but I decided I'd like to put in more time on the current print. Approached the building from the ocean side today, which meant slowdowns behind beachfront sightseers and along the narrow streets of Ocean Grove, but at least I wasn't traveling in circles. (and it's good that I did because the main road is still completely blocked off) The next critique night is in about 2 weeks and I'd like to be able to bring the finished block to show the group. 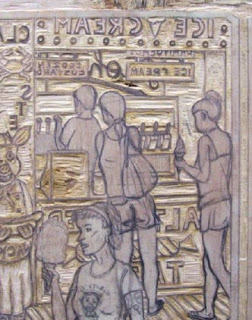 Still working the upper part of the left panel, doing pieces of the ice cream stand and the bar. 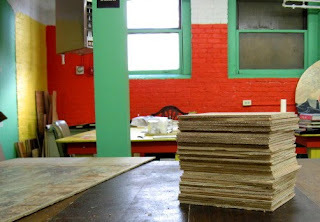 Plywood combines a natural material and an artificial process, for both good and bad. Since I started cutting this particular board I have found some sections with issues- gaps in the core layer, sections that are softer or harder, etc. As a result, some parts have been tricky to cut. Gaps and soft sections can lead to wood tearing instead of cutting cleanly, no matter how sharp the tool is. (testing in other parts of the board show that it's still plenty sharp) Don't have to worry about surface shredding in the super hard areas, just a lot of effort to remove each splinter of wood. Both of these problems have popped up all over the section with the ice cream stand, part of why it's going slow. Despite that, I finished some significant portions of the parts I was working on today. I still have to resolve a few questions inside the bar, and after that I can get to cutting out more of the details. Meanwhile, since I haven't shown it in a while, below is a photo of the current state of the whole block. Thanks to multiple utility projects going on around Ocean Grove I had to take an unexpectedly convoluted route to get to the parking lot outside my Studio building. 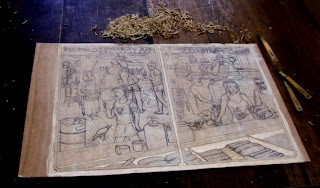 But eventually I got there, bringing back much of the materials that I had taken for use with my various woodcut presentations last week. That includes the current block and my tools, allowing me to put in a few hours of cutting. Worked the same areas I had over the weekend- bits and pieces of the ice cream stand and bar. Over the weekend I had brought the current boardwalk block and my tools with me to the workshop. The main purpose was for demonstration, showing both how I do the compositional drawing and also how the various types of woodcut tools are used to cut a block. At times when my students were busy on their respective blocks, I would turn to mine and advance my progress a little. The above photo shows some of the areas I worked on. 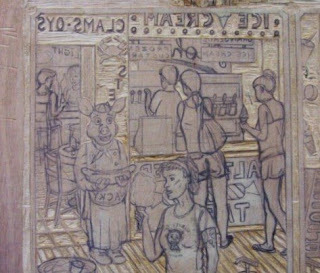 I outlined a few menu items in the upper corner of the right side block, but otherwise it was all on the left panel- the rest of the foreground counter, the boardwalk, and bits and pieces of the ice cream stand and bar. 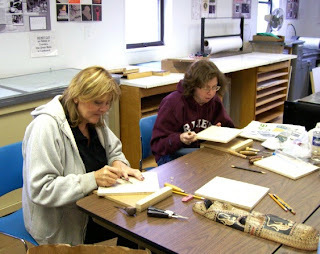 The fall woodcut workshop at PCNJ resumed this morning. The participants showed up ready to work and got right to it. 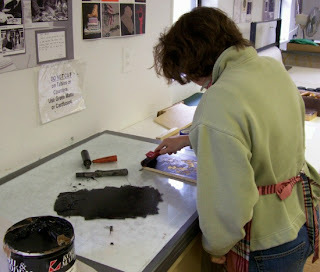 They took a break long enough for me to demonstrate surfacing a block with wood filler as well as to talk about the variety of inks, tools, papers and other items needed by relief printmakers everywhere. After that, back to cutting wood. Later in the afternoon one of the students brought her block to a state where she was ready to try printing it, so I demonstrated how to ink and print a block, and supervised while they all tried if for themselves. 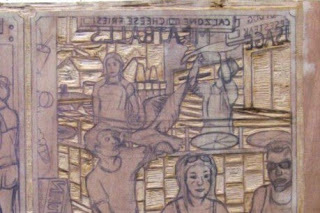 The result- three very nice state proofs of the block and some very enthusiastic new converts to the medium of woodcut, excited to keep going with it on their own. 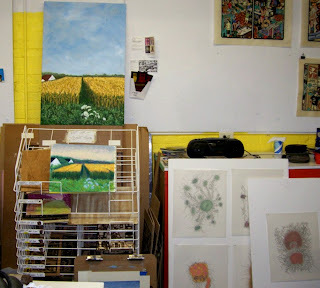 Despite threats of major east coast storms all weekend, I was able to get myself, my tools, a pile of useful books, and a nice selection of art safely up to the Printmaking Council of New Jersey early this morning and get my woodcut workshop started. The students, all first time visitors to our headquarters near North Branch Station, started with a tour of the building. After the group assembled in our newly reorganized studio (including a new larger roller press, new counters and storage, and the Vandercook brought up from the basement) I started by showing everyone a small selection of some of my past and recent work, with an emphasis on prints that show the diversity of the possiblities of woodcut. I had also brought with me three (Culture Rot, School Days, Blatantly Kitsch) of the many group exchange folios I've participated in over the years, going through them with special attention to examples of relief printing in the sets. The intended effect was achieved- the students were now excited by the possibilities of the medium and couldn't wait to get started on blocks of their own. The other significant demonstration today was a cutting demo. 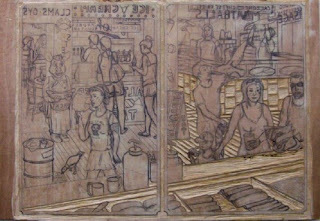 The printing demonstration will wait until next time, ideally with a finished block started in today's session. I put in 2+ hours today cutting, all of which was in the area of the pizzeria. 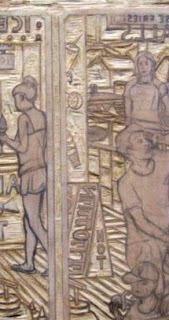 That may seem like a long time for such a small section, but this part of the composition is probably the most detailed piece of the whole block drawing. Lots of overlapping and transparent structures, requiring careful cutting to make sure I didn't remove anything I'd regret later. Other than the signs, the figures, and the pizzas, this section is pretty much done. I'll probably leave that stuff for later and next start cutting the areas around the figures on the other side of the block. Also spent some of my Studio time gathering things (tools mostly) I'll need for the various woodcut demos I'll be doing later this week. Just in case I don't have time to come back over the next few days. 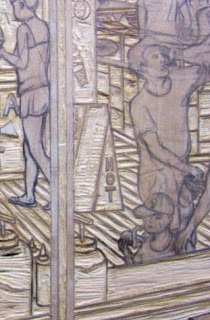 Going to be a busy week for woodcut. 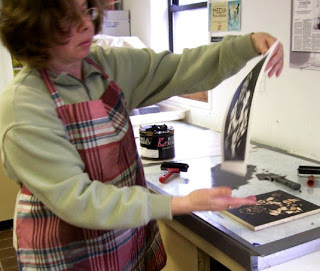 Have one of my college classes starting their woodcut project this week, and my workshop at the Printmaking Council of NJ coming up on the weekend. Some of my preparations are for both, but today it was all about my college students. I took one of the boards I bought the other day and cut it up into identical small panels. Everyone gets one. In past years I would be making blocks (a little larger) for the the PCNJ workshop as well, but they have some wood up there already that we'll use. Once I got that task out of the way (including sweeping up all the sawdust) I could turn my attention back to the boardwalk food block. 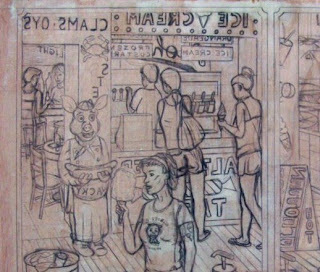 Today I continued up the right side panel, cutting out the rest of the foreground counter, then moving up into the negative spaces of the boardwalk and the facing side of the pizzeria counter. Probably more in the pizzeria next time. Took a roundabout ride through my corner of the county this afternoon. One of my stops was a home center, where I picked up a couple of pieces of wood. They had two different batches of lauan there, and I decided to try one of each. A little more driving around and I ended up back at the Studio. I tested both pieces of wood with my tools and found both decent for cutting. One will be cut up into small panels for one of my classes, and the other will be used for something of mine somewhere down the line. More important, today I started the cutting of the new block. As usual, I cut the outside of all the panel borders first. I was in the mood to continue, so I cut the divided area of the foreground grilling area along the lower edge of the block. So far so good. The Boatworks is closed down for a month for some needed repairs, which means that all the regular programming there is suspended until November. However, the figure drawing group marches on. 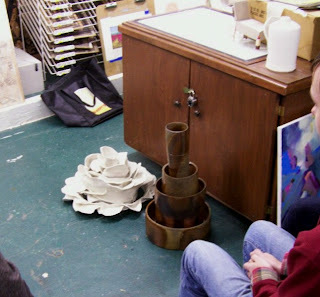 One of the participants has offered to host the regulars in his studio for the previously planned October meeting nights. So that's where I was tonight. Something else different tonight- two models. Both are models who have posed for the Belmar group before (one recruited by the other) and they liked the idea of working a session together. (reminds me a little of a couple of girls I knew in my undergrad years) They alternated some individual short poses and posed together for two longer poses. 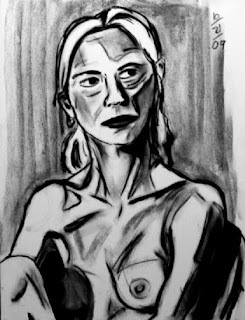 The 30 minute charcoal drawing above was my best of the night. Today I got to see the results of something set in motion a while back. I was contacted a few weeks ago by a student on the staff of the Cougar's Byte, the official weekly student newspaper at my university. The student wanted permission to interview me by e-mail regarding the new Adjunct Exhibition in the gallery and my contribution to it. I agreed and a few days later he sent some very general questions, to which I replied back with my answers. 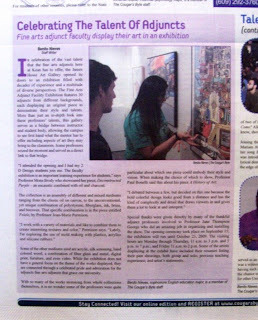 The issue was published yesterday, and I was able to finally see the article in print today. It was nice to see that my print was featured in the photo illustration, the piece that the students are intently looking at. The one quote of mine that did make it into the finished article is about how I chose the piece I put into the show. The article is also available online for anyone who wants to read it. Something arrived in the mail today that I was expecting, a fun pak from my friend Dave. This one was heavy on gallery postcards, and included one print related item- a brochure from a travelling Smithsonian exhibition, The Art of Hatch Show Print, the legendary Nashville letterpress shop that has been producing boldly graphic posters for any and all occasions since 1879. 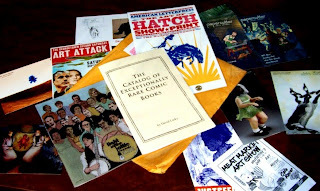 The highlight of the mailing was Dave's brand new poetry collection, The Catalog of Exceptionally Rare Comic Books. Dave has written poems in the past on related topics, such as superheroes, newspaper strips, and cartooning. This collection features poems that could be items in such a catalog, some based on actual very rare comics, and some that exist only in his imagination. Thanks to these poems, they now exist in my imagination, too. It takes me back about 25 years, to a time when comic books were very much on my mind, and sometimes at night my dreams included imaginary comic titles (typically took the form of late 60's Marvel anthology books with appropriate vintage graphics) and characters (such as my previously blogged about pig). 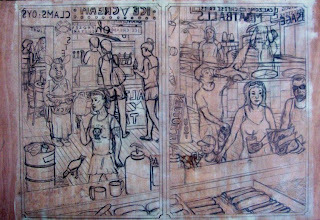 I gave up my comic book dreams both literally and figuratively about the time that I started to really get into woodcut prints. 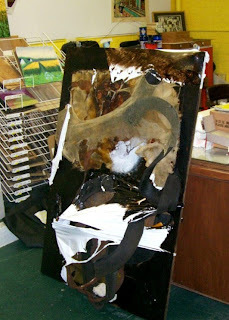 No regrets there- seeing what I accomplished in each medium, woodcut is what I'm meant to do. Thanks to last month's critique night being pushed back a week and to the arrangement of the calendar, it's only been 3 weeks since the previous meeting. One might think that the group wouldn't have had much time to get new things ready for tonight's meeting, but that wasn't the case. 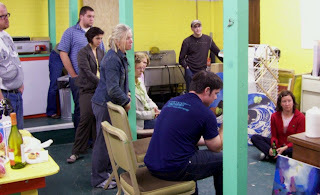 We had a very big crowd squeezed into the Studio- 14 people, and 12 of those brought art to show. 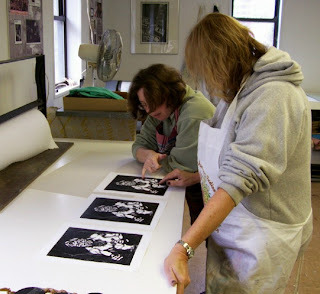 The above photos show the variety of work up for discussion tonight- woodcut, silkscreen, etching, drawing, painting, photography, ceramics, sculpture, jewelry, and collage. I showed the drawing on the current block, along with the early paper sketches, since someone had asked about my working methods last time. Got a few suggestions, for this one and future prints in the series. If not for our strict time limit for each artist's discussion, we might have been there until midnight. The first order of business today was to fix the spelling in that neon MEATBALLS sign, the corrected version shown above. I usually catch these things eventually. Back in grad school there was one time where I switched two letters and didn't discover it until I had cut and printed the block. Impossible to fix at that point. Looking at the block in a mirror helps. After I took these photos, a mirror check helped me realize that I had one backwards letter in the part of the block shown below, which I have since fixed. Added a few details to this part of the scene over the past couple of days, mostly in the ice cream stand and inside the bar. 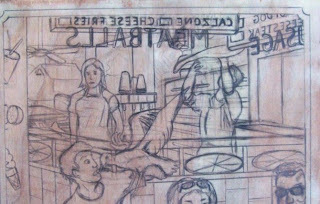 I also played around with adding one more item to the foreground counter, something that had appeared in the earliest paper sketches, a napkin dispenser. Tried a few different designs in a couple of places, but in the end I decided against it. I like the empty stretches of the counter on either end. The whole block in its current version is shown below. If I haven't come up with any changes I want to make, I can start cutting later this week. 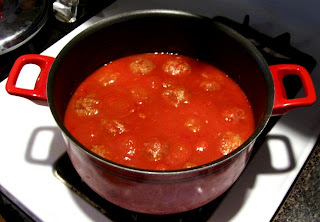 My spelling issues of this weekend put me in a mood for meatballs today, so I cooked up a nice pot of them while I had the football games on. A pleasant way to spend a Sunday afternoon. Been a busy week, so I was happy to get some time to get back into the Studio today. Took care of some other tasks first (getting some baked goods up the street, using the big tables to grade a whole pile of student projects), then got to the block. No major changes today. Fixed up some of the lettering on the various signs, the most obvious on the menu board area (see above photo) of the pizzeria- the big letters will be neon signs. A few minor adjustments inside the pizzeria as well. I also cleaned up some of the lettering on other signage around the whole scene. I still need to fix a few more little things (such as the spelling in that "MAETBALLS" neon sign- the transposing of letters is an occasional hazard when doing a lot of backwards lettering), maybe add a few more details, before it's ready to cut.